Since 2000, Shelley Sabga has sold twenty-six novels to numerous publishers. She has written a seven book contemporary series for Avalon books. She also published The Love Letter, a western for Avalon. Five Star Expressions published Suddenly, You in February of 2007. This novel is a historical western set in the mountains of Colorado. Shelley has written nine novels for Harlequin American Romance. Cinderella Christmas, her first novel with them, reached number six on the Waldenbooks Bestseller list. Her second book with them, Simple Gifts won RT Magazine’s Reviewer’s Choice award for best Harlequin American Romance of 2006. The Mommy Bride, was chosen by Romantic Times Magazine as one of their TOP PICKS for May, 2008. Under the name Shelley Shepard Gray, Shelley writes Amish romances for Harper Collins’ inspirational line, Avon Inspire. HIDDEN and WANTED the first two novels of her ‘Sisters of the Heart’ series, were chosen to be Alternate Selections for the Doubleday/ Literary Guild Book Club. FORGIVEN, book 3, has received glowing reviews. Avon Inspire is releasing four novels by Shelley this year. Before writing romances, Shelley lived in Texas and Colorado, where she taught school and earned both her bachelors and masters degrees in education. She now lives in southern Ohio and writes full time. Shelley is married, the mother of two teenagers, and is an active member of her church. Until Robert Miller met Lilly Allen, his world had been dark. A widower after only two years of marriage, he'd been living in a haze, feeling that, at twenty-four, his life was already over. But thanks to his friendship with Lilly, he now has new reasons to wake up each day. He knows his connection to her doesn't make sense. She's only nineteen, with a past the whole town talks about. Even more, she's not Amish, like Robert. A marriage between the two of them could never happen. Lilly's heart is drawn to Robert, not to his faith. No matter how much she admires his quiet strength and dependability, she doesn't think she could ever give up her independence and reliance on the modern world. Is their love doomed before it even begins? 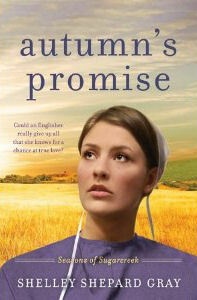 If you would like to read the first chapter of Autumn's Promise, go HERE.